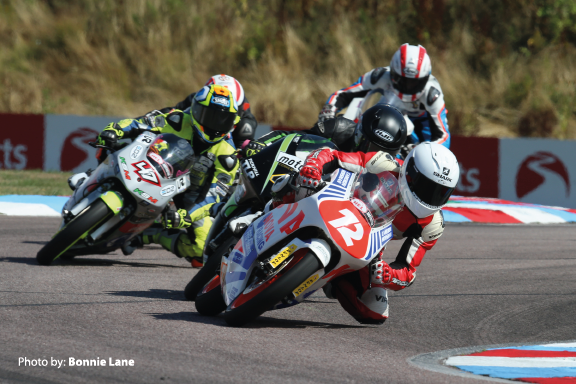 Round five of the Hel Performance British Motostar standard class championship took place at Thruxton last weekend. The 2.4-mile circuit is one of the quickest on the British Superbike calendar despite not having any obvious straight. It is a combination of fast flowing corners and very popular with the riders. Horsman finished race one in fourth and seventh in race two. Free practice took place on a scorching Friday. As temperatures increased the majority of the riders improved their lap times during the afternoon session. Cameron Horsman finished both free practice session in fourth place. Having gearing issues Horsman couldn’t make the best of the warmer conditions and set his fastest lap, a 1:24.119, in the morning. worth it as his lap time of 1:23.226 on the final lap put him second for the start of race one. On a very warm track Horsman made a good start to race one. Over the 12 laps the rider from Forest Hill was in an intense battle with Fenton Seabright. The two provided plenty of entertainment for the crowd as they constantly switched places, sometimes several times in one lap. On the final lap the two riders were neck and neck as they approached a slower GP class rider. Seabright managed to move up the inside whilst Horsman was forced to overtake around the outside losing valuable time. Whilst both Seabright and Horsman were overtaken by the more powerful GP class machine on the run to the line Horsman had to settle for fourth in his class just 0.115 seconds from the podium. The 14 lap second race of the weekend was an amazing spectacle for the large crowd assembled at the circuit in Hampshire. It didn’t start well for Horsman who dropped from fifth at the start. With the leader of the race long gone Horsman clawed his way back to the six rider fight for second place. The positions of all these riders changed with exhausting frequency. The riders showed great maturity in their race craft as it would so easily for an over exuberant racer to crash out taking three or four with him. Horsman finished the race in seventh which seems disappointing, but with the gap between the second place to seventh at just 0.8 seconds it was an extremely tight race.